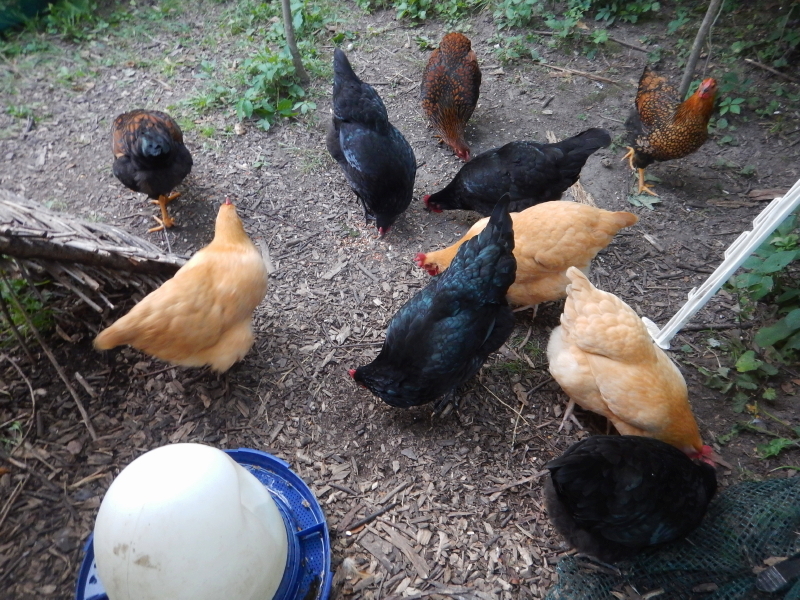 I didn’t hear anything from Cyndie yesterday, before she headed to the lake with Melissa and her girls, so I’m guessing there was no sign of what happened to our two missing chickens. Now there are ten. Before Cyndie left, she was very industrious and constructed quite a netted courtyard around the coop for the chickens, so they weren’t confined to quarters all day after all. The second I got home from work yesterday, I hopped on the lawn tractor to mow all our grass, so I didn’t even chat with Jackie for more than a brief moment to make a plan for Delilah. From the looks of things, I’m guessing she probably assisted in the installation of the coop fencing. While I was mowing, she headed off to her night job at a local pub/eatery until closing time, so it was just me tending to all the animals, getting them tucked in for the night. It was a gorgeous August night. It feels a little like nature is at a plateau lately. Even while putting conscious effort into focusing on the immediate moment, there is an unmistakable hint of summer’s end teasing of what comes next. While walking one of our trails through the woods, I noticed the view through the trees is already opening up beneath the canopy. The late summer shade of our forest has brought an end to many of the lower plants that had started out strong in the early season sun. That shade provides valuable air conditioning which takes the edge off days like yesterday, when the heat index was climbing into the 90s. It felt a lot hotter while I was commuting through the cities on the steamy pavement than it did when I finally arrived home. Ahhhh. Living in the country. Huzzah! It’s a real blessing. But you do have to keep an eye on your chickens.